In praise of the temporary basal. I’m ramping up the workouts in anticipation of another ride in September. This will be the Tour de Talbot, which covers a lot of the same ground that my ADA ride covered in May. Without a doubt, getting older means a lot of things when it comes to training. It means getting up at 4:45 a.m. to get to the gym is tougher (but not impossible). I get a few more aches and pains than I used to. No surprise there. Recovery seems to take a lot longer than it used to. That’s hard when you’re a guy who’s used to powering through the pain. Mentally, once I get started, it’s tough to take a break. One of the things that’s interesting about working out as I get older is that when working out, my insulin needs haven’t really changed a bit. In the three-plus years that I’ve been wearing my insulin pump, whenever I work out, I’m doing a temporary basal of ½ unit per hour. That’s roughly 38 percent of my regular basal rate in the morning. To be honest, nobody told me about temp basals when I got my pump. That’s another thing I learned from the DOC. I guess everybody just wanted to make sure I could handle changing my infusion set and counting carbs at the beginning. Lucky for me, in my early days of pumping, I just disconnected my pump before my workout began. I remember reading about temp basals online for the first time and thinking “Wow… I can work out for an hour or more and not be at 300 mg/dL when I’m finished?… Brilliant!”. It does seem kind of weird that my temporary workout number is still the same. Of course, I haven’t been attached to a pump for very long yet, so maybe it’ll change over time. Plus, I still have to be in a good place BG-wise before my workout begins, or I might wind up with less than stellar results after. Still, I like when I can just set something one way and forget about it. And still feel great diabetes-wise when it’s all over. So here’s to the never-changing temporary basal rate for my workouts. Always true, always keeping me in range. Everything about my diabetes life should be this foolproof. Note: DO NOT take what is written here as advice. If you’re thinking about altering your basal patterns, for workouts or otherwise, you should seek advice from a medical professional first. August DSMA Blog Carnival. The emotional impact of diabetes. What can a parent of a child with diabetes, or a person with diabetes, do to help reduce the emotional impact of caring for diabetes? I’m going to start off by saying it’s okay to vent a little. When we’re doing everything we can to handle life and diabetes at the same time, and the hemoglobin A1c comes back higher than we’d hoped? At those times, it’s hard not to feel defeated. So it’s okay to let off a little steam and complain about how hard it is to maintain a healthy diet, exercise routine, BG checks, infusion set changes, and effective basal rates, along with work, school, kids, family, paying the bills, etc. Once we’re through complaining, however, the cold hard facts are that we’ll have to get up tomorrow and diabetes will still be with us. We’ll have to do that fingerstick and that bolus before we start in on breakfast. And knowing that, in those moments, is where it really gets hard sometimes. Enter the Diabetes Online Community. At any time of day, in every corner of the world, it seems, there are people who understand exactly what you’re experiencing. Because they’ve been through it themselves. When you reach out in those moments, these individuals are there to console you and support you. They make you stronger by reminding you that you are not alone, and you can keep going. Empowering, without judgment. Just perform a Twitter search for the hashtag #DOC. When I checked recently, I found a dozen or so recent conversations of support, tips, and other examples of people in the community giving a leg up to those who need it, when they need it most. Certainly, we can try to lighten up on ourselves. Caring for our diabetes or our child’s diabetes is difficult, taxing work. It requires both physical and mental strength and stamina. How many times per day do we perform math calculations? How often do we check glucose? Have we treated overnight lows and lows at work? You bet we have. And we do this every day, usually with the only promise that we’ll have to do the same thing again tomorrow. So while it’s important to stay on top of things as much as possible, we can’t always kick ourselves for missing the occasional bolus or miscounting the carbs on the dinner plate. None of us is perfect—we will make the occasional mistake. We cannot let it define who we are. Overcoming those difficult diabetes moments is what makes us champions. Last, but not least, when all else fails, we know that there are professionals who can help us deal with the emotional pitfalls that come with years of caring for a chronic disease. More people than you can imagine have already reached out for that extra measure of consultation and feedback to get their emotions on track again. It’s nice to know that when we need it, there is an extra layer of care to be found. There are a number of things that try to get in the way of us living a fantastic life, while living with or caring for diabetes. Hopefully, those setbacks are minor. Emotions (sometimes, raw emotions) are part of our entire package. But they don’t have to drag us down. By venting a little, commiserating with our online pals, letting ourselves off the hook now and then, and reaching out for professional help when we need it, using the tools available to us helps us to reduce the emotional impact of caring for, or living with, diabetes in our lives. 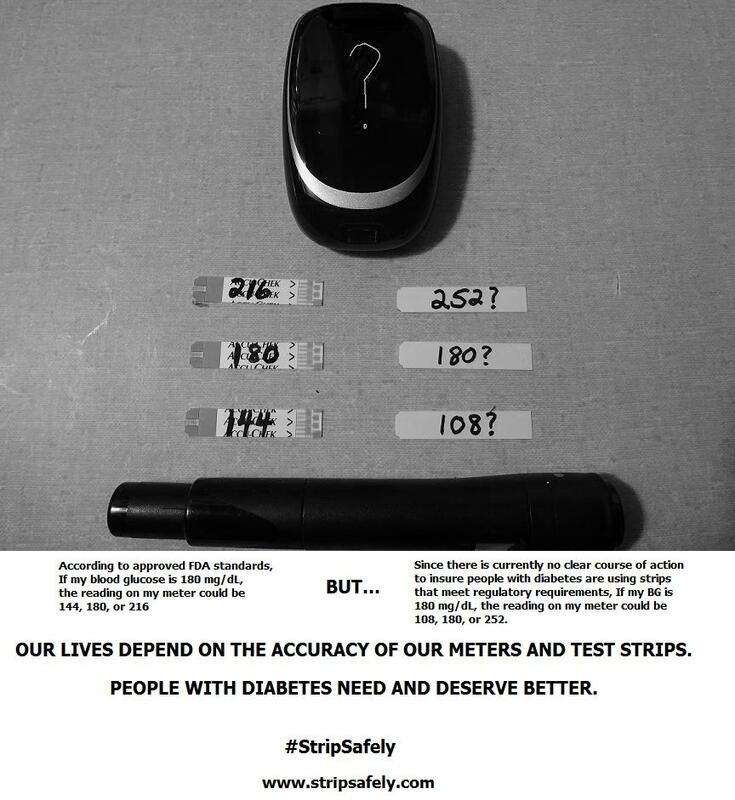 Diabetes Art Day, #StripSafely edition. Today is an extra-special-important version of Diabetes Art Day! Thanks to Lee Ann Thill, today is a day for all of us to put our creative minds to use to help spread the word about the importance of meter and test strip accuracy. The Strip Safely initiative has really taken off, and today’s D-Art Day is another chance for us to shout about the fact that meter and test strip accuracy is not nearly what it should be. To find out more, visit the Strip Safely site at www.stripsafely.com. You are encouraged to create your own art using test strips… upload your work of art HERE. You can also go there to view other special pieces of D-Art. Without further ado, here’s my art, if you can call it that. I’m among the most art-challenged people on the planet, so I did a little photo thing that turned into kind of a public service announcement. Oh well. Here it is… And don’t forget to check out the other great works of art on Diabetes Art Day– Strip Safely edition. On this #BlueFriday, I’m thinking of my grandfather. I don’t know why. Every once in a while, I think of him when I think of growing older. My paternal grandfather was the only other person I know of in my family with diabetes before I came along. He was dead for almost five years by the time I was diagnosed. No one ever said whether he had Type 1 or Type 2 diabetes. Maybe at the time he was diagnosed, they didn’t make that distinction. I don’t know. I do know that he took insulin to help keep his glucose in check. After my diagnosis, I remember my grandmother, all of four feet something, pulling an old box out of the back of her apartment that contained things like old, old syringes and antiquated urine strips. She wanted me to have them so they didn’t go to waste. I didn’t have the heart to tell her that they were way beyond their prime. Mostly, I remember my grandfather during the 1970s. I don’t ever remember seeing him in the act of treating his diabetes. No insulin injections, no treating lows, no glucose checks (though in those days, I wouldn’t have wanted to see that). Diabetes was never discussed, and I don’t remember anything that he ate. I don’t remember hearing him discuss trips to the doctor, where, just like today, he would have had to go just to get his insulin prescription refilled. Mostly, he was quiet when I would see him, usually watching TV. He went to work every weekday until he retired, and drove a Ford Fairlane sedan—manual transmission no less, three on the column, if you know what that means. He never drove an automatic in his life. Always had a crew cut. He lived a pretty typical blue collar life, at a time when you could work in a factory your entire career, buy a house, and help send three kids to catholic school and then to college. Maybe diabetes just wasn’t a big deal to him. Maybe he didn’t want to make it a big deal. Today, I wonder if he was so sedentary at home because he was afraid of doing too much and going low. But that requires an awful lot of speculation on my part, and the real truth could be the exact opposite of that. Later in life, in the 1980s, he would spend time in hospitals off and on, until he eventually lost his life late in 1986. I remember hearing stories about how some of those hospital visits involved grandpa fighting with nurses and orderlies who were trying to care for him, and how he always demanded to be released and allowed to go home. He was gradually losing his memory by that point, although in retrospect I don’t know how much of that was grandpa losing his mind and how much might have been hypoglycemia (or even hyperglycemia). Diabetes was hard to treat even in the early eighties, even in a hospital. I feel bad for him when I think of those times when maybe he just needed more food or more insulin, couldn’t get it, and lashed out because nobody caring for him could identify the signs. Mostly, when I think of my grandfather, I’m glad that I’m living with diabetes here in the 21st century. I have so many more tools available to me to help me survive. Even though there are horror stories of doctors and hospitals screwing up care for people with diabetes, my personal experiences have been quite positive. And with advances in technology, I don’t even need a syringe to deliver my insulin, though I do have to prick my finger to check my BG instead of peeing on a strip. I like to hope that I’m living a better life than he lived, and I’m quite sure that he would have wanted it this way. So here’s to you, grandpa… Gone, but not forgotten. I hope wherever you are, you’re living a better life too. Wordless Wednesday– More Summer Goodness. These fellas are known as Mr. Stripey tomatoes. 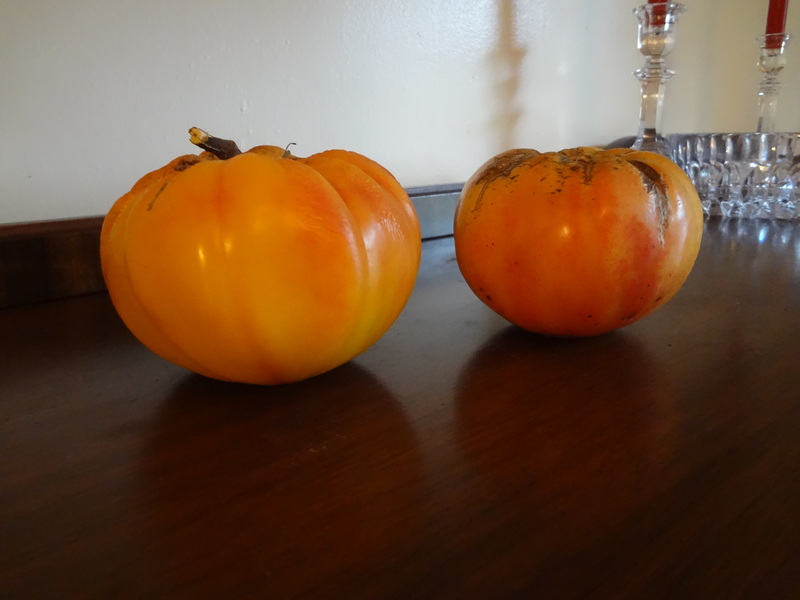 Mr. Stripeys are an heirloom tomato, which is why they’re not perfectly round and they have a couple of blemishes on them. 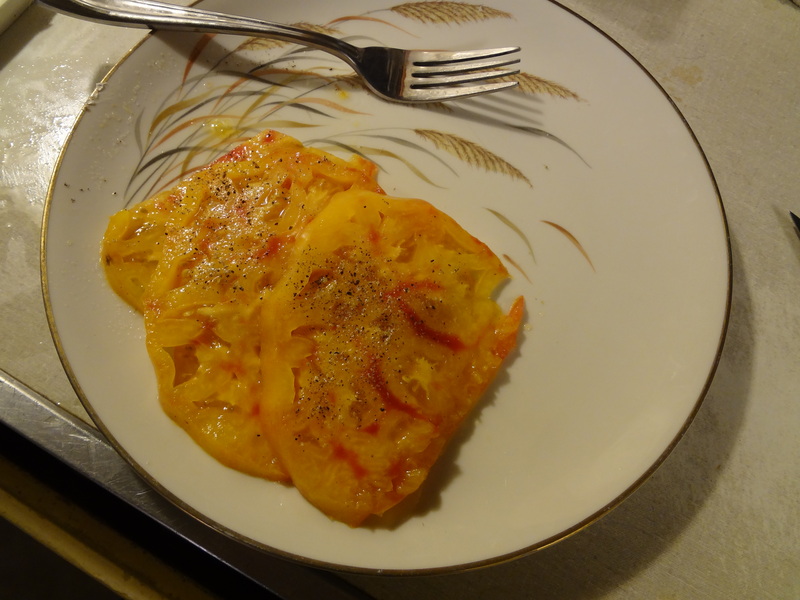 In addition to those factors, Mr. Stripeys are meaty, earthy representations of what real tomatoes taste like. And if I’m lucky, I’ll get enough this year to freeze a few and use them in a pasta sauce. These babies are worth waiting until August for.